Solar panels qualify for tax credits. Home improvements that reduce energy consumption help the environment and they can also cut your tax bill. The federal government offers tax credits for several energy-saving home upgrades that are good through the end of 2016. Tax credits technically differ from tax write-offs or deductions in that credits directly reduce your tax liability instead of reducing your taxable income, but the result is the same: You pay less in taxes. 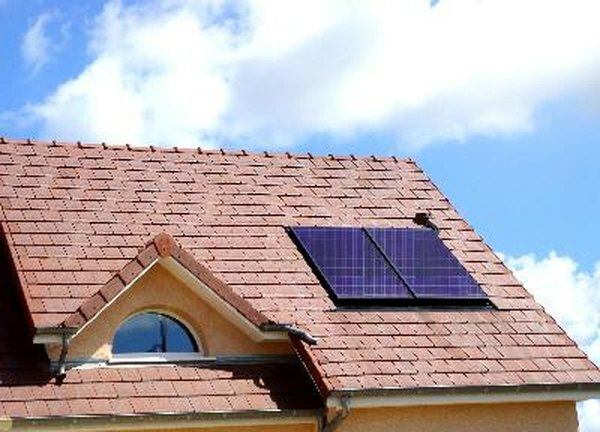 The government offers tax credits on two types of solar power systems: solar panels and solar-powered water heaters. The credit is equal to 30 percent of the cost of the upgrade and for solar water heaters it includes installation costs. Solar panel systems must provide electricity for the home and meet applicable fire and electrical codes to qualify for the credit. Solar water heaters must derive at least half of the energy used to heat water from the sun and provide water for the home to qualify. Residential wind turbines can convert wind energy into electricity usable in the home. The government offers a tax credit for small wind turbines of 30 percent of the cost of the upgrade with no upper limit and includes installation costs. Wind turbines must have a rated energy capacity of 100 kilowatts or less to qualify. Geothermal heat pumps harness heat stored in the earth to provide a home with heating, air conditioning and hot water. The credit is 30 percent of the cost of the heat pump and includes installation costs. Heat pumps must meet the requirements of the ENERGY STAR program that are in effect at the time of expenditure. Exact energy-efficiency requirements vary based on the specifications of the heating system but all ENERGY STAR-qualified geothermal pumps qualify for the tax credit. Residential fuel cell systems qualify for a tax credit of 30 percent of the cost to a maximum of $500 per 0.5 kW of power capacity. Fuel cells need an efficiency rating of at least 30 percent and a capacity of at least 0.5 kW to qualify. The tax credits for solar energy systems, wind turbines and geothermal heat pumps apply to new and existing primary and secondary residences, but the credit for fuel cells does not apply to second homes.